Currently viewing the tag: "Intel"
IDC Human Capital Mission – Build and sustain an agile Total Force that acquires, exploits, and employs ID capabilities to achieve Navy mission requirements. IDC Human Capital Vision – Attract, develop, and retain a cohort of highly trained and competent officers, enlisted, and civilian professionals who are fully integrated with the Navy’s combat forces, and delivering warfighting effects (including Cyber Warfare) to Naval and Joint forces across the full spectrum of military operations. Develop a strategy for the effective utilization of all components of the Total Force, including a specific plan of action for the civilians across the IDC. Identify which ID human capital advantages are complementary to the overarching operational mission. Create and strengthen partnerships with centers of innovation and thought leadership within the Federal, Defense, and private sectors. Validate IDC core competency framework and refresh the Community-specific competency models. Conduct competency-based training needs assessments. Conduct analyses to prioritize, resource, and sequence training development, modification, and repurposing efforts. Develop cross-functional ID career paths. Define the mission requirement (duties and tasks). Translate mission requirements into capability requirements. Develop a resourcing strategy for the fulfillment of capability requirements (manpower). Orient the total Navy workforce to the IDC mission and vision through a multi-mode, leadershipdelivered strategic communication initiative. Leverage kill chain concepts (integrated fires) to depict and communicate the process through which ID discipline contributes to the delivery of warfighting effects. 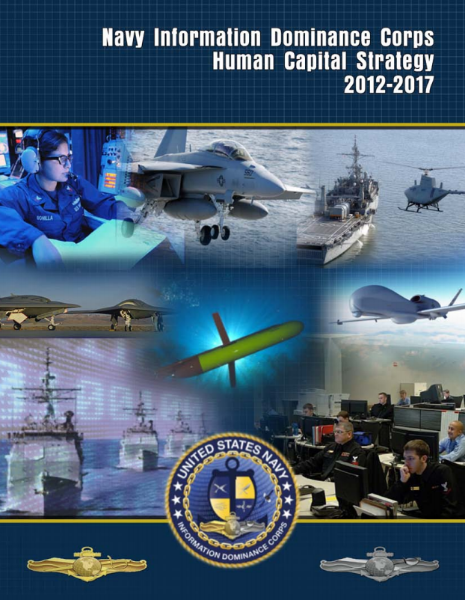 This IDC Human Capital Strategy supports the Navy Strategy for Achieving Information Dominance, additional related supporting documents include: the Navy Information Dominance Roadmap, 2013-2028; Navy Cyber Power 2020; the Naval Intelligence Strategy, 2013-2020; and, the 2013 Navy Space Strategy. Within this integrated framework, the Navy begins in earnest the process of marshaling its resources, galvanizing the workforce, and aligning Navy’s Information Dominance capabilities to fully enable the Navy’s primary tenet of Warfighting First.